Chase Elliott (center) talking to his pit crew earlier this year at Talladega. A guaranteed spot in the next round of the Monster Energy NASCAR Cup Series Playoffs won’t detour him and his team from trying their absolute best to capture as many stage points, as well as a victory, in Sunday’s 1000Bulbs.com 500. TALLADEGA, Ala. – With his win at Dover on Sunday, Monster Energy NASCAR Cup Series driver Chase Elliott not only secured his second victory of the season, but he also punched his ticket to the Round of 8 in the NASCAR Playoffs. Even though Elliott doesn’t have to worry about the unpredictability of Talladega Superspeedway’s 1000Bulbs.com 500 Sunday affecting his immediate postseason advancement, the Dawsonville, GA, native plans to go all-out in his return to NASCAR’s largest track this weekend because he knows his performance can certainly have long-term championship implications. If the race at Charlotte to close out the Round of 16 was any indication, points are at a premium and even one position (worth one point) in any race can be the difference between a driver moving on to the next round and seeing his hopes to hoist the Cup dashed until next year. Seven-time champion Jimmie Johnson was eliminated from playoff contention after he lost a three-way tiebreaker for 11th and 12th place with Aric Almirola and Kyle Larson, who earned the final two positions after posting better finishes in the three first-round races. At the same time, Johnson would have been in and Larson would have been eliminated by one point if it had not been for Larson making a last-lap pass near the finish line to gain the additional spot to force a tiebreaker. And the outcome could have been different had any of those drivers won one more playoff point throughout the year or stage/race point during the Round of 16. This is why Elliott is going to play the long game at Talladega and give it everything he’s got to grab stage wins and even a race victory. Elliott’s race and stage wins have pocketed him 13 playoff points, but he knows, barring a win in the Round of 8, that number might not help him reach the Championship 4 given that drivers like Kevin Harvick, Kyle Busch, Martin Truex Jr. and Brad Keselowski have banked far more playoff points. For Talladega’s 1000Bulbs.com 500, its stage segments will be divided at Lap 55, Lap 110 and Lap 188. Under NASCAR’s three-stages-racing format, there is an incentive for drivers to run hard every race in the playoffs even when championship contenders like Elliott clinch a berth in the next round via a win. Drivers can earn points by performing well throughout a race and finishing in the top 10 at the conclusion of each of the first two stages (10 points for first, nine for second, etc.). Additionally, stage winners receive a coveted playoff point. At the drop of the checkered flag, the winning driver receives 40 points, five playoff points and an automatic berth in the next round (if the driver is championship-eligible). For the rest of the field, second place receives 35 points, third place earns 34 points and so on. Drivers carry through their season-long accumulation of playoff points when points are reset each round of the postseason. 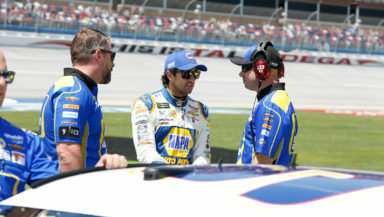 “You know, I’m sure when we’re at Talladega and the race is going on, I’ll feel a lot better,” said Elliott’s crew chief Alan Gustafson, who has five poles and a best finish of second in the 2012 fall event with Jeff Gordon as a crew chief at Talladega. “But we’re going to have to be right in the middle of it, too. We can’t just write those races (coming up, Kansas also) off. We’ve got to use that as an opportunity to go try to gain some more stage points and bonus points to put us in a better position for the Round of 8. A win for Elliott this weekend would also have special meaning since his father, Bill Elliott, holds a special legacy at the 2.66-mile complex with the NASCAR official qualifying record of 212.809 mph as well as two victories, including one in 1985 in which he came back from two laps down during green flag conditions to capture the win. Chase has shown signs that he has inherited the superspeedway driving talents of his father, considering he won the pole and placed fifth in his first Cup start at the facility in 2016, as well as finished third in GEICO 500 earlier this year. When the field takes the green flag at Talladega for the 1000Bulbs.com 500, Elliott will be the lone competitor with a spot clinched for the Round of 8. At the same time, he will have the chance to bolster his championship aspirations and create some historic moments for his team. Fans should expect Elliott to aggressively put the pedal to the metal this weekend because looking back and realizing a major opportunity was missed is not an option when he has both nothing to lose and everything at stake.